The headquarters of United States Forces Korea will be moved to a sprawling army garrison located south of Seoul next week, marking a new chapter in the US military presence here amid a flurry of speculation over the troop’s future roles. 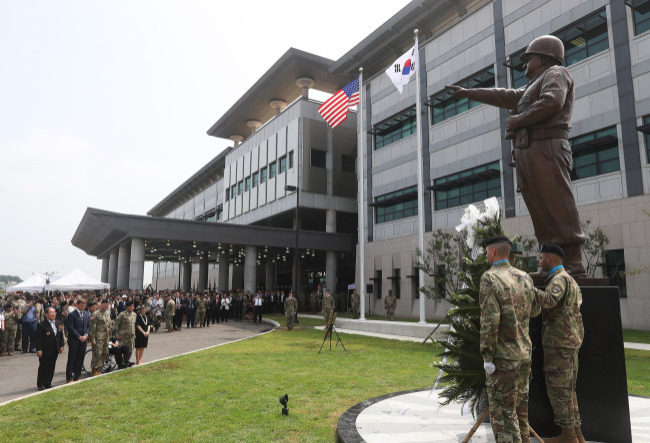 According to the Ministry of National Defense and USFK, the opening ceremony of the new USFK headquarters building in Camp Humphreys will be held on June 29. Located in Pyeongtaek, Gyeonggi Province, some 70 kilometers south of Seoul, Camp Humphreys is the largest overseas US military base. Top military and government officials from South Korea and the US are expected to attend the event, while the presence of US Defense Secretary Jim Mattis at the event has not been confirmed. Mattis is slated to be in Seoul on June 28. The move to Pyeongtaek is part of a plan to relocate the USFK from its longtime home of Yongsan Garrison in downtown Seoul, where US forces have been stationed since 1945 when the country was liberated from Japanese colonial rule by the Allies. Under the $10.7 billion relocation scheme, the USFK’s ground component Eighth US Army relocated its headquarters to Pyeongtaek in July last year. The remaining USFK service members and US-led United Nations Command are set to complete the move to Pyeongtaek by the end of the year. The South Korea-US Combined Forces Command’s headquarters, also located at Yongsan Garrison, is likely to move to a separate building inside Seoul’s Ministry of National Defense compound. It would use part of Seoul’s Joint Chiefs of Staff building located in the ministry complex. The relocation of the USFK comes amid speculation that US President Trump is considering withdrawal of some or all of the 28,500 US troops stationed in South Korea as a bargaining chip in denuclearization talks with North Korea. Trump has also threatened to withdraw the US troops on demands that South Korea pay more for maintaining the US military presence. Under the current cost-sharing agreement signed in 2014, South Korea provides $830 million per year for the upkeep of the US forces. While the size and nature of the USFK can be adjusted depending upon the nuclear negotiations with North Korea, the very presence of the USFK will not be discussed until the US-North Korea denuclearization talks reach the final stage, according to experts. “There could be talks about drawing down USKF or changing its role from fighting against North Korea to maintaining balance in the region. Whatever it might be, it would most likely happen at the final stage of the negotiations,” said Kim Yeol-su, head of security strategy at the Korea Institute for Military Affairs.